There's only one way to catch the elusive flying conditions that mark our winter season: release the hounds! Oahu pilots will drive around the entire island for days on end to hunt down a flight. Over the past week, a determined pack of air-starved beasts could be heard baying for their wily quarry at every corner: Dillingham, Kaena, Makapuu, Kahana, Koko Head, and Diamond Head. On many days we've done more driving than flying, but we know that's what we have to do this time of year for any chance to bag the big game. A slight promise of flyable conditions drew a passel of us out to Dillingham last Saturday, but we arrived to find rain building out from the southeast. 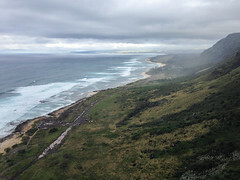 The clever Californicans decided to hike to the albatross nesting area at the point, while the not so clever locals hiked up as soon as the drizzle stopped. We had Brian egging us on from his perch high above the knob, scoping out new climbing routes. But once we reached the knob it soon became clear that this was a doomed mission. There was almost no wind flowing up there. We knew we'd be lucky if we could even launch and avoid the wet hike down. The two pilots with the most experience at the knob got up there first, and they patiently waited for everyone else to join them and then helped them all off. Or anyway that's what should have happened. Instead, Drew and I could barely wait to get the heck off of that accursed plateau in the diminishing cycles. Thanks for holding up our wings, guys! As we zoomed out of there and straight down, we were both thinking: good luck guys, and we'll try to save you some cold refreshments...! As we'd feared, the cycles abated to almost nothing, and Berndt and Jonathan were lucky to get out after a few attempts. JJ set up next, and we saw his wing come up and then fall down in an unnatural manner. Turns out he'd slipped off the little cliff behind launch while trying to pull up. But he was okay! Whew. He tried a few more times, and with Bill's help, he got out of there and joined the growing crowd below. Bill was alone up there. By now the cycles were not just dead, they were wafting down the mountain, blowing offshore. There was no question that Bill would have to hike down. But no one told him that. He tried to pull up a few times, and we could see his wing facing up the hill into the valley. Was he really going to try to launch that way? Then we saw his wing come up and pitch down the hill in a very unnatural fashion. Oh no! But he soon came on the radio to assure us that he was okay. He'd pitched head first off the little cliff behind launch, denting his helmet but breaking no bones. Whew! We urged him to hike down, but he said he'd try one last time. So one last time, he pulled up his wing, facing into the valley, and then he ran it off like a demon. He was up! He turned out from the valley to zoom down and land right in front of us, skimming the grass for a smooth touchdown. We watched his wing flutter down behind him in the offshore flow. Yikes! I guess all's well that ends well. Six crazy pilots happy to be down safe on the muddy landing strip! Meanwhile we heard Harvey and the holdout Californican BobP had waited all day, in a paragliding duck blind apparently, and at the end of the day they scored a sunset lighthouse flight in northwest conditions at Makapuu. 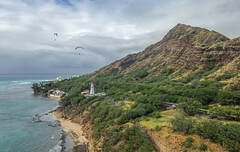 On Sunday, with absolutely no chasing or hunting required, scores of pilots flew long leisurely flights in truly perfect sea breeze conditions at Makapuu, as chronicled by Thom. I have to think that's the reward we got for our previous day of sacrifice! On Monday, we got light southeasterly flow and sea breezes. The hunt was on. A bunch of us raced out to Nanakuli only to find the flow at the shore raging strong, and the clouds roiling like a nest of angry cobras. Guess that southeasterly flow wasn't quite as light as the forecast had suggested. So what's hungry pack of dogs to do? Drive to the opposite corner of the island! We figured Koko Crater might work if the southeast flow was that strong. Meanwhile we heard that a couple of intrepid hunters had bagged a brief roller coaster of a flight at Kahana, ending in a roller coaster landing at Punaluu, with one getting slightly bedraggled in a surf landing. Those southeast conditions can be pretty interesting at Kahana! When we arrived at Koko Crater to check it out, the southeast flow turned out to be not strong enough. It was light enough that the sea breeze turned it south. So it looked like we were down to the last resort. Frank and Jetflap have showed us that it can work at Koko Head in a southerly sea breeze. But checking from the LZ, it seemed too light and still too southeast there. We retired for a late lunch at Greek Marina, and after that everyone bailed except for me, JK and Scrappy. And somehow I convinced them that it was looking better up there, so we ran up for a last ditch attempt to save the day. But the sea breeze was waning fast. The direction wasn't bad, but there was not even enough flow to properly kite a wing, as I demonstrated for the amusement of the others. At this point we would be happy to take sled rides to the LZ, if we thought we could make it. It's a bit disconcerting, because the LZ is way around the corner out of sight. I wasn't feeling confident, having barely made it on a recent flight. And on Scrappy's last flight here he hadn't made the LZ at all. So we were concerned about our chances to avoid the dreaded hike down. Scrappy and JK conferred over their smart phones and soaring tools to calculate the necessary glide. At a mile away from 600 feet, we'd need 9:1 in still air. I texted Frank to get his experienced verdict, and he texted back, from the safety of his couch at home: you can make it if you go straight from launch to the LZ. Somehow that was enough for me, and I finally took to the air and burned around the corner out of sight. I came in with a generous few hundred feet, made a few turns and landed. I radioed back to my buddies: Guys, I'm hanging in a palm tree, but I'm okay, and I'll try to get myself down. Scrappy came back over the radio right away, replying that if I'd picked any other kind of tree for my fib, they might have believed me. Oh well. A moment later he appeared in the sky, wafting down to join me. And a moment after that, JK did the same. Fireman Dave walked over to say hello, waiting for Sal to finish soccer practice across the way. The sun was setting and it was the most beautiful ending to a long and difficult day of hunting. Scrappy's video of JK landing is worth blowing up HD and full size. On Tuesday, I woke up and started my coffee, then brushed my teeth. As I leaned over to spit, my back went out. Maybe it was all that hunting the last few days. I knew I wouldn't be chasing much of anything on this day. I stayed in bed all day and took ibuprofen, wondering what kind of day I might be missing. Turns out it was a super easterly sea breeze. The tandem daredevils were making it work out of Cactus, in their usual super determined way, even though the flow was converging up both sides of the ridge. I talked Larry out of a flight all by himself at Kahana with the clouds drifting offshore and the sensor spiking above 120 degrees. I guess he hadn't heard about the previous day's roller coaster splashdown! I spent Wednesday recuperating. For me that meant hiking and climbing all around the ranch here, to test out how bad I'd strained my back. I heard that some intrepid air hunters stalked conditions to Diamond Head, but the southerly flow and sea breeze didn't quite come together. On Thursday, it looked like we might get some nice light southwest flow to fly Kaena Point. We decided to drive from the Dillingham side this time. We met a truckload of skydivers headed out with their speed wings. I hoped that didn't mean it would be too strong for our regular size wings. We drove out to the point in Duck's amazing truck, and hiked around the corner to check conditions. It seemed pretty darn strong. Probably the most wind we've felt down there. Duck hiked up to the low launch and reported 15-20. Hmmm. Not exactly what we were hoping for. We figured discretion trumped valor today, and we retreated back the way we'd come. But we weren't ready to quit yet. It seemed like it might be strong and south enough for Diamond Head. So we drove to the opposite corner of the island, meeting a few other guys out there. But it was just a bit too light. We had a theory that as soon as the sun sank low enough the thermal block would stop keeping the wind away. Or maybe that was just an excuse to hang out and take in the natural beauty of the area. Which was abundant. Anyway, we waited until the sun dropped into the ocean, but the wind never turned on, so we threw in the towel, hoping for better chances back at the same spot the next day. 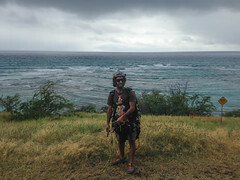 On Friday, we returned to Diamond Head, and we actually got some nice moderate southerly flow, but we also got lots of prefrontal showers. Lots and lots of them. An intrepid crew showed up to wait for dry windows between periods of drizzle and mist, and we actually scored a few different nice sessions. Our final attempt fizzled out as the direction turned too light and west, while a huge black monster cell lumbered over town and unleashed a torrent of rain. We counted ourselves lucky to have flown a few sweet flights, and called it a day, or maybe we called it a week. We knew the weekend would be a wash, as the cold front approached and began to slowly drench the island for the next two days. This first video shows Jorge working hard to get down for a top landing in the pumping flow. He had to do some serious flapping to degrade his glide, practically stalling his wing at the end to force it down. Don't try that at home! This next video is Jorge's second launch, from the west facing slot where we all took off. Jorge, Jeff, Dave and I were the only ones lucky enough to be there for the flyable windows. Dave's was super short but exciting, right in front of a huge downpour. Also great to see Frank and Jeff and Brent out there. This last video is Jorge's second top landing. This time he set it up perfectly and needed no flapping at all. My favorite approach! I was narrating for the nice Australian family behind me. Thanks to that dude who was so intently checking out the surfers for making room. I'm sure there are other interesting stories to be told, or pictures or videos, from this past week of hunting. I look forward to reading about them in the comments! And let's hope we get some easier weeks for chasing it, in the remaining winter months. For the sake of our cars and tires and fuel bills if nothing else! Well, as they say, its a dirty job but someone has to do it. With sensors and weather predictions going more 'south' than a Guy Hagi report, we can only rely on these packs of desperate souls. I am sad and glad that possibly this affliction has at least been cleared from parts of my brain. I have been able to keep my name from this list of rabid monkeys the last few weeks and only scoring the Makapuu and Diamond head days that were actually flyable. It wasn't easy, I was itching and scratching to keep the infestation of texts and intel from infecting my strong desire to leave the ground. Thanks for the great write up, It actually makes me feel good that I didn't chase on these days........but that's only in hind site. It will be Time to Fly, Get Your Gear and Gas Money and Go!!! !